Our hours: Monday-Thursday 7am - 5pm. Friday 7am-4pm. Welcome to Westwood Auto Body, a service-oriented business providing expert-quality auto collision, body repair, and painting services. for all makes and models. Located on Westwood Blvd. just north of Olympic Blvd., we proudly serve customers residing within the greater West Los Angeles area, and also provide services for the State of California and the U.S. Government. We have an excellent reputation for reliability, trustworthiness and dedication to workmanship (see our Testimonials). 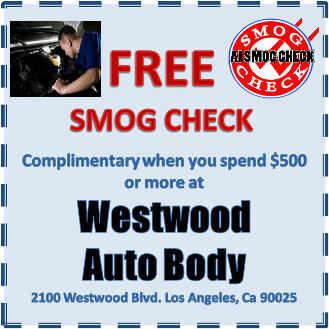 Putting our customers first, Westwood Auto Body is best known for affordable and remarkable quality work. We work with our customers to meet their needs and budgetsno job is too small. One of the few green and environment friendly shops in Los Angeles, Westwood Auto Body participates in saving the earth by using a variety of paints, including Envirobase High Performance PPG.